Icosahedral T=31d capsid, 74 nm in diameter, composed of 1200 P1 (spike) and 60 P2 (capsid) proteins. The 12 five-fold vertices have turret-like appendages expanding 13nm above the capsid shell. 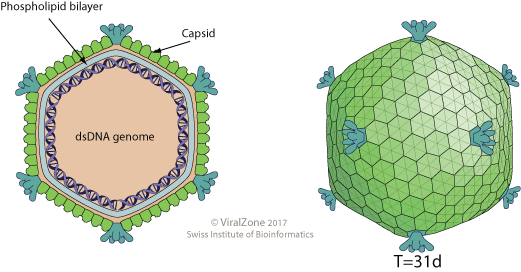 The capsid encloses an internal lipid membrane. Linear dsDNA genome of 17 kb. The genome encodes 36 ORFs. Mature virions are released from the cell by budding through pyramid-like protrusions.